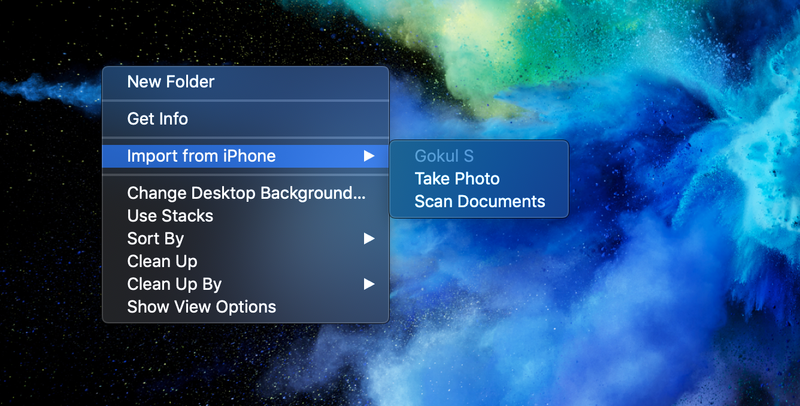 How to scan document or images on Mac using iPhone iPad or iPod devices. Use your iPhone, iPad or iPod devices to scan the image or document easily and used in your Mac devices. If you want to attach any document in Mail are you want any document to scan mean you need the scanner. But the scanner price amount will be high and all of them not need the scanner usage will be very low. You can solve this issues with your mobile and computer. You can use your iPhone, iPad or iPod camera to scan the document or images easily. How to use the iOS device to scan the document easily. Follow the below steps to scan the document easily. For this scanning process, you need the Mac System and iOS devices with the latest operating system. Mac with macOS Mojave and iOS device with iOS 12. You’ve enabled Bluetooth on both your Mac and iPhone. And connect both devices in Bluetooth. Both mac and iOS devices are login with same Apple ID. And both devices are connected with the same Wifi connection. How to use the Continuity Camera. If you want to take the photo to open any of the supporting application I mentioned above. After opening the application press control click or right click in the mouse. Now the menu will appear in that you can select the Take photo option. Now the camera app will open in your connect iOS device just tap the camera shutter button to take the photo and add in your document. If you want to scan the document and added to your mail or any other process. Just open mail or any one of the application you needed mention in the above list. And Press Control and click or right clicks on your mouse it will open the small menu bar in you can see the option call Scan Documents. Just select the Scan Documents option Camera app will open in your connect the iOS device. Now take the picture in the mobile came and it will save the image in pdf format and attached to your application. If you want to scan the document and save for future use just go to Desktop. And now Press control and click on the empty area in the desktop or right-click in your mouse. It will show the menu option in that select the Scan Documents option. Now device camera will open and take the picture. After taking the picture you can crap the image and remove the unwanted part of the image you take an image. Crop process will be finished it will save the scanned document in pdf format in the desktop. This above all process is work only your both the device connected in the same wifi network and same apple ID. You’ve enabled Bluetooth on both your Mac and iPhone.